NETWORK FINALS: There were no changes from the morning’s preliminary ratings. CABLE HIGHLIGHTS: ESPN had a healthy share of the Tuesday cable Top 10, with its COLLEGE BASKETBALL doubleheader at 0.79 (Auburn vs. Duke)/0.43 (Arizona vs. Gonzaga), and the week’s CFP RANKINGS SHOW up 0.03 to 0.37. On USA, WWE SMACKDOWN dropped 0.11 to 0.69, and REAL COUNTRY was down 0.06 to 0.17. History’s CURSE OF OAK ISLAND edged up 0.02 to 0.68, with a lead-in half-hour at 0.31, and lead-out BROTHERS IN ARMS arriving at 0.24. On Bravo, BELOW DECK was steady at 0.53, and FLIPPING OUT was up 0.07 to 0.35. MTV’s THE CHALLENGE lost 0.07 to 0.44. TBS’s THE GUEST BOOK gained 0.08 to 0.36. Food Network’s CHOPPED ticked up to 0.36. Paramount’s INK MASTER rose 0.08 to 0.30. On Comedy Central, TOSH.0 climbed 0.05 to 0.29, and THE JIM JEFFERIES SHOW was up 0.02 to 0.14. On ID, WELCOME TO MURDERTOWN gained 0.03 to 0.27. MSNBC’s RACHEL MADDOW SHOW led cable news at 0.27/0.40/2.9M, with Fox News’s HANNITY at 0.24/0.40/2.7M, and CNN’s CUOMO PRIME TIME at 0.23/0.31/1.1M. 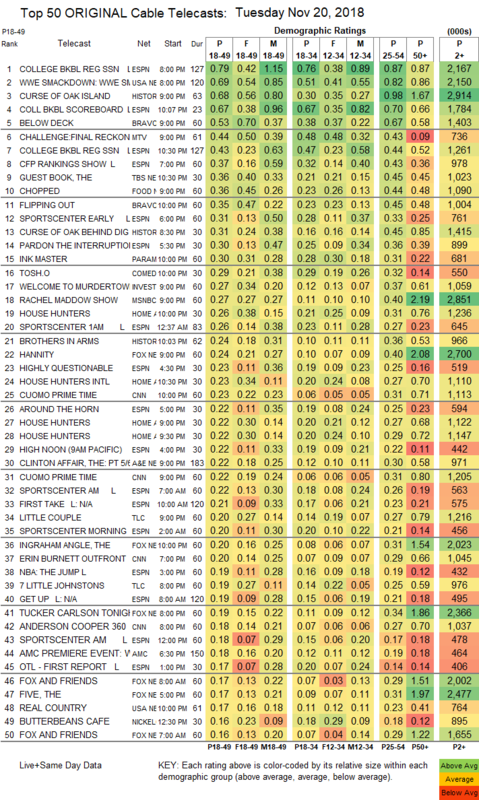 On HGTV, HOUSE HUNTERS was at 0.26/0.22/0.22 compared to last week’s 0.25/0.23/0.21, and HOUSE HUNTERS INTL ticked up to 0.23. The third night of A&E’s THE CLINTON AFFAIR was rated in a 3-hour block at 0.22. On TLC, THE LITTLE COUPLE shrank by 0.09 to 0.20, and 7 LITTLE JOHNSTONS was down 0.05 to 0.19. On Discovery, VEGAS RAT RODS ticked down to 0.15. Lifetime’s MARRIED AT FIRST SIGHT: HAPPILY EVER AFTER rose 0.03 to 0.14 and HONEYMOON ISLAND was at 0.10. 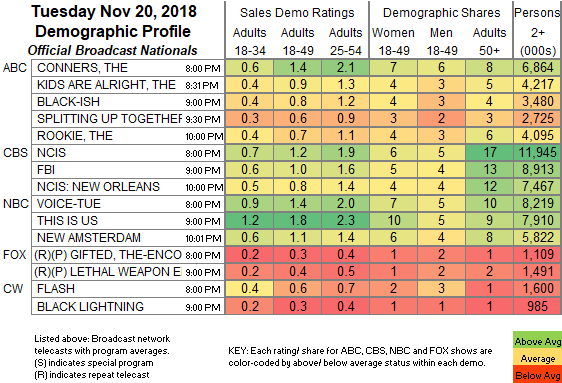 The second night of AMC’s THE LITTLE DRUMMER GIRL was off the chart at 0.04/232K.